Overall, “Bedknobs and Broomsticks” is a cute family movie but if I had my choice I’d “Mary Poppins” any day. If you're looking for a bit of nostalgia, the 1971 Disney Classic "Bedknobs and broomsticks" has been released on Blu-ray and DVD. This extended version restores 20 plus minutes of footage, which was not seen originally in theaters. Blending live action, animation and musical numbers, Bedknobs is another example of the family friendly movies Disney continues to make to this day. Angela Landsbury (Murder, She Wrote) plays Miss Price, a witch apprentice during World War II who has ambitions of helping England defeat the Nazis. Much to her dismay she is forced to take in three orphans from London and the four of them take off in search of the Professor who runs the witch apprentice Correspondence school that Miss Price is enrolled in. What they find is a conman, Emelius, played by David Tomlinson (Mary Poppins) and Miss Price fears all hope is lost. However, when they find the other half of a magical spell book in London, they fly off on an adventure, courtesy of a bed knob. "Bedknobs and Broomsticks" follows the formula movies of the time combining live actors with the best animation and several musical numbers. With the music and script written by much of the same team that wrote "Mary Poppins", one would expect lots of catchy tunes you sing along with and remember long after the movie ends. However, I didn't find that to be the case and didn't enjoy the music or story nearly as much as "Mary Poppins" or another family classic of the time, "Chitty, Chitty, Bang, Bang". The story lacked the same "heart" as Poppins and I found the dialogue recited by the children to be obnoxious and rude. It was not the message parents wanted portrayed to their young children in 1971 and not entirely realistic of children in 1940's England. I did think the animation was great for the time as was evident since it won the Oscar. Lansbury and Tomlinson do a great job as do the children in the film. The animated king reminded me of ‘Tony the tiger" from the frosted flakes commercials which was a little distracting. My favorite song, "under the briny sea", was fun and could easily have been the precursor for "under the Sea " from "The Little Mermaid". Unsurprisingly, the extras revealed tat song had originally been written for "Mary Poppins" but ended up not being used. The Blu-ray extras included segments about the music and interesting tidbits including the fat that "Bedknobs and Broomsticks" was actually started before "Mary Poppins" but was shelved (until after Walt Disney's death) in order to start production on Poppins. There was also a fascinating segment about how they inserted live actors into the animated scenes and compared how they do it today using computers. The remastered film showed crispness and the Audio was master Audio DTS-HD 5.1 which improved audio recorded more than 40 years ago. 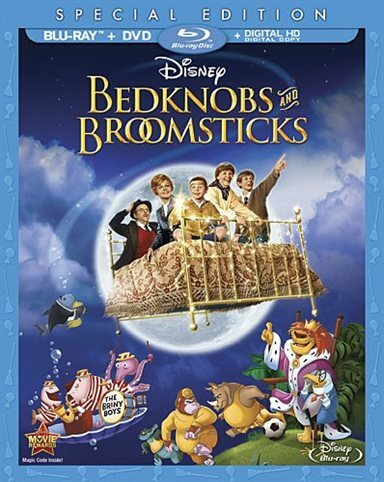 Download Bedknobs and Broomsticks from the iTunes Store in Digial HD. For more information about Bedknobs and Broomsticks visit the FlickDirect Movie Database.